Varathane Diamond Wood Finish is the best solution to protect exterior wood against extreme weather conditions. It is specially formulated to provide superior durability and flexible enough to expand and contract as the wood and weather changes. UV inhibitors reduce fading and superior mould and mildew resistance make your outdoor projects last for years. 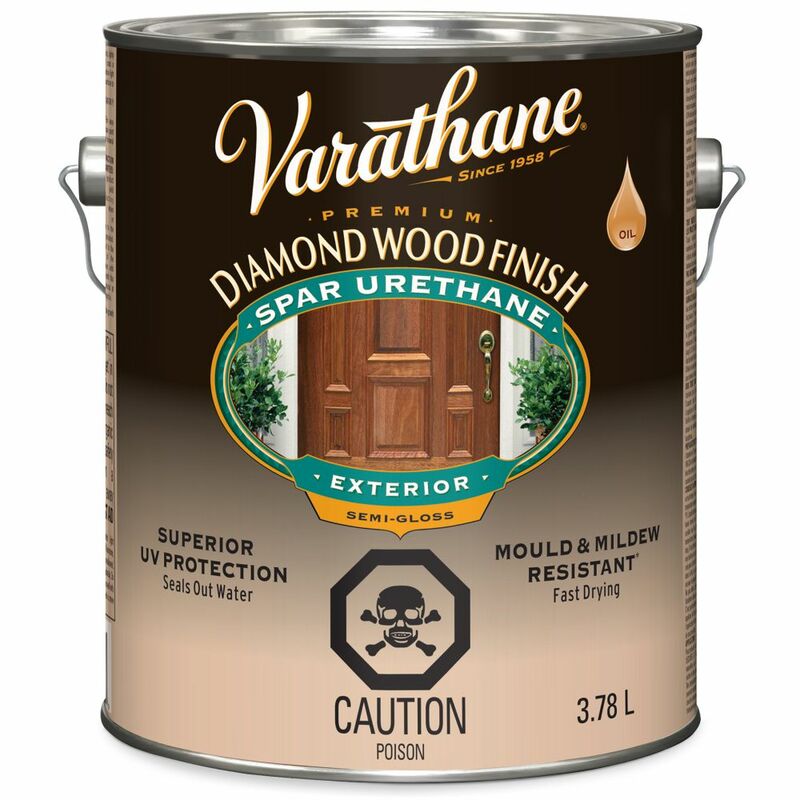 Varathane Diamond Wood Finish is fast drying and provides a warm golden glow. A 100% acrylic semi-transparent, water repellent stain with easy water clean-up. Use on exterior, properly prepared, unsealed wood surfaces such as decks, railings, shakes, shingles, siding, roofs, fences and patio furniture. An advanced exterior stain, combining the best features of oil and latex for superior colour retention, adhesion, penetration and durability. It provides a film that is highly resistant to cracking, peeling, blistering, weathering, chalking and erosion. A semi-transparent stain featuring Nanoguard technology, provides ultimate durability with water clean-up. This advanced 100% acrylic penetrating formula is specially formulated for exterior wood decks, siding, fences and patio furniture, plus provides excellent scuff resistance and water repellency. A premium quality, 100% acrylic latex, opaque solid colour stain for all wood types. This 100% acrylic latex formula provides excellent adhesion and forms a highly protective and durable finish, which resists scuffing, cracking, peeling and blistering. Varathane Diamond Wood Finish OB Exterior Gloss 3.78L Varathane Diamond Wood Finish is the best solution to protect exterior wood against extreme weather conditions. It is specially formulated to provide superior durability and flexible enough to expand and contract as the wood and weather changes.